Tax refund season is an exciting time for many of us! With a sudden influx of money, we are faced with so many decisions. What should we do with it? Should we splurge and take a vacation? Be wise and pay off our debts? A little of both? Decisions, decisions! I have a few suggestions on how to spend that tax refund that combine fun and practicality. Of course, how many things you can do on the list depends entirely on how much you get back. Consider it a starting point for brainstorming other ways to spend that tax refund. Energy-efficient home appliances. Okay, so maybe a new washer and dryer isn’t exactly fun, unless you love doing laundry! A new stove, on the other hand, could be exciting for foodies. If you’re still using old, energy-draining appliances, consider using your tax refund to update to newer, more efficient models. You’ll save money in the long run, putting even more in your pocket next year. A Staycation. Rather than spending your entire tax refund on a faraway getaway, take a smaller portion of it and plan a few fun days in your own town. Visit your tourism center for ideas on new places to check out. When we live in a town, we tend to ignore those fun touristy areas, figuring we’ll get to them eventually. Time spent with family is always a good investment! Classes to learn a new skill. I’ve had a beautiful DSLR camera for over a year now. Guess what? I still shoot on auto. Why? Because I need someone to show me how to use all the buttons and wheels! If you’ve been dying to learn a new skill, take some of your tax refund and invest it into your own education. Who knows, you could turn a hobby into a profitable business when you’re done! Gift cards for holiday shopping. If you typically use your tax refund to pay off the holidays, break the pattern of giving credit card companies a fortune in interest. Instead, set your budget for December now, then buy a gift card in that amount. Put it away until it’s time to get started on your holiday shopping at the end of the year! A new-to-you set of wheels. Whether you’re like me and driving around in a car that could cease functioning at any moment or just need a second family car, your tax refund can help you put a nice down payment on a great used vehicle. DriveTime can help you find your dream car with just a few mouse clicks. 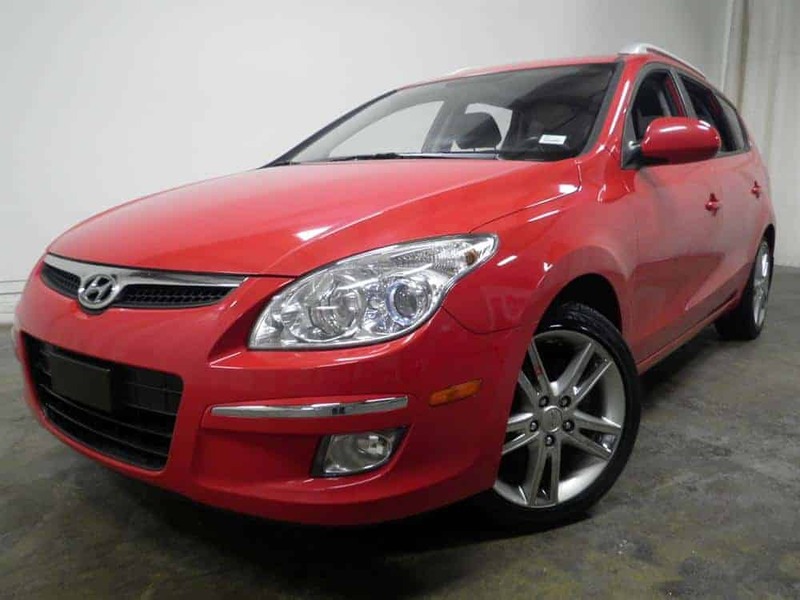 I found a couple of cars that I would love, including this super pretty and very roomy 2012 Hyundai Elantra Touring. The DriveTime used car search is actually really fun to use. It’s easy to select only the makes that you prefer, set your mileage preferences, body type, years and more. It’s even easy for someone like me who doesn’t know much about cars, as the details on each car are written in plain language (meaning a girl who barely knows where her windshield washer fluid goes can read it!). Check out the DriveTime dealership locator to find out if there are dealerships in your area, then invest in your dream car with your tax refund. Using your tax refund in ways that improve your home, family or life is never a waste of money. Whether its time with your family or a smart used car purchase, these things keep giving long after tax season ends. This is a sponsored conversation written by me on behalf of DriveTime. The opinions and text are all mine. I never get a refund. Maybe one day I will get a fat refund I can spend! These are some neat ideas. We usually end up applying it to our savings to be used as needed over the course of the year. Our tax refund will be going towards our savings this year. Although part of our savings is an account for a family vacation. Great ideas! We will be paying bills with any return we get I am sure. Being self employed I typically don’t get a tax refund but if I do it goes directly into my savings account to boost my savings. From there I can make decisions about how and when to spend it. We usually don’t get one, but if we did, we’d be saving! We will be saving ours! We want to move and not only do that with a company but be able to have some extras for all the hook ups etc! I would most definitely save a little bit for a rainy day, then treat myself to whatever i fancied! Great post! I love the idea of it – no one every posts about this! Good work! Great tips on how to spend your tax refund. I’m a tax preparer and I tell my client’s some of these tips as well. Another tip is to set up an IRA if you don’t have one with your refund. You can also put more money in your 401K to make sure you’ll be okay in the future. If you have bills to pay, always use your tax refund to pay down those debts! I love your ideas to spend the tax refund money! I will be using it to pay down debt. We usually use ours for home improvements and things we’ve put off all year! These are very smart tips!!! I need to forward this to half the town I live in since people aren’t very wise with there returns! Our refund is our vacation fund. We spend it on travel every year.